Grand Central Station, more correctly Grand Central Terminal, is a Beaux-Arts masterpiece from New York's Gilded Age. The structure, built in 1913, the second on that site, is also a vital link in the New York City transporation system. 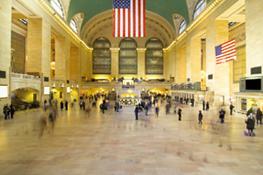 Over 125,000 commuters pass through Grand Central daily in addition to the over 500,000 daily visitors. Grand Central was constructed by the Grand Central Railway Company, from whom it takes its name. It is the first station to feature electric-powered trains, thus reducing the fumes, dirt, and danger of coal-powered trains. The station, completed in 1913, was immediately popular and spawned a neighborhood building boom that included many skyscapers and hotels, including the Chrysler Building. The 49-acre Grand Central Station complex is dotted with spectacular examples of early 20th century art. Among them are the celestial ceiling in the main concourse, painted by Frenchman Paul Cesar Helleu. In front of the terminal is a large metal and glass clock, the world's largest example of work by Louis Comfort Tiffany's studio. Atop the station's 42nd Street facade are statues of Minerva, Hercules, and Mercury by the John Donnelly Company. Like many US train stations, Grand Central, by the 1960s, had fallen into disrepair and become synonymous with urban decay and crime. The beautiful corridors were used mainly by the city's homeless and commuters scurried quickly around them on the way to their trains. Plan were drawn by several prominent architects, including I.M. Pei and Marcel Breuer, for a skyscraper to replace the station. New Yorkers were outraged at the plans to demolish Grand Central, and led by a very eloquent Jacqueline Onassis, took the fight all the way to the US Supreme Court. The people eventually won and rennovation of the station began in 1987. It was to be a 12 year project -- one that cost $250,000 million. The restoration unveiled several forgotten treasures, most notably the celestial ceiling painted by French artist Paul Cesar Helleu, and buried for years under layers of soot and grime. The project also removed the blackout paint, added during World War II, from the stations 75-foot front windows, returning the light and airy feeling to the main concourse. Grand Central has been featured in numerous films throughout its history, including North by Northwest, Superman, The Fisher King, and Madagascar. Grand Central is the longest train station in the world, with 44 platforms and 67 tracks. Grand Central was the first two-level train station. During the terminal's heyday, in 1947, Grand Central was the busiest train station in the world. Over 65 million people, roughly 40 percent of the US population passed through its corridors. Grand Central is open to the public every day from 5am until 1am. In addition to the Lexington Avenue subway line, Grand Central offers commuter trains to Westchester, Putnam, and Duchess Counties in New York and to Fairfield and New Haven Counties in Connecticut. Grand Central is no longer used for inter-city trains. Those trains depart from the city's Penn Station. Visitors can choose from several eateries in the terminal, the most notable of them is the venerable Oyster Bar, opened in 1913. The restaurant, in addition to serving quality seafood and fish, is known for its vaulted Gustavino ceramic tile ceiling. Other Grand Central restaurants include Michael Jordan's Steakhouse; Metrazur, a Mediterranean restaurant; a New York-style deli; a food court; and an up-scale food market.